Open to students from across the world, We Are Connected Scholarship is a $1,500 financial grant for those who need assistance in the funding of their educational journey. It is an endeavor that reflects I Have Vitiligo’s mission of supporting people dealing with vitiligo, but extends it and shares it with students. Every year, one applicant will be chosen to receive the financial grant. Applicants for this scholarship can only be high school and college students who are currently and officially enrolled with their institute. Students may only be given this grant once. Therefore, students who apply for this grant after having receiving it in a past period, will be automatically declined. 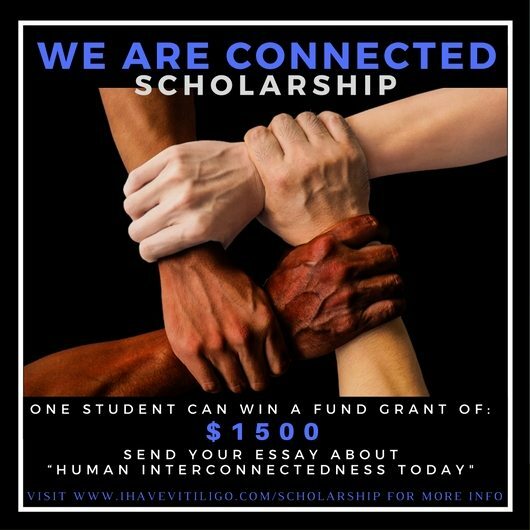 Aspiring scholarship grantees must submit an essay entitled “Human Interconnectedness Today.” The written piece should be a creative description of how interconnection among humans are maintained at the age of technology and how technology both allows humans to progress and regressive interconnectivity. It may also mention the evolution of human connections through the years and whether technology is speeding the process up, or slowing it down. The minimum word count for this piece is one thousand (1,000) words. Content must be original with any and all sources cited. Any plagiarized content will result in instant disqualification for the applicant. Applicants who are not applying for the first time may not resubmit a previously submitted piece. Along with the essay, a one-page personal information sheet and short biography should also be submitted to scholarship@ihavevitiligo.com. We also require a scanned copy of the student’s proof of enrollment. No application charges will be collected. Applications are accepted until Oct 30, 2018 and applicants will be informed of the decision on the first week of April. A prize check of $1500 will be sent to the winner after being notified via the contact information the applicant included in their submission. Failure of the winning applicant to collect their scholarship will force their submission to be revoked and another applicant chosen in their place. Giving I Have Vitiligo rights to publish the essay in our website is already implied when you submit your application. In contrast, we do not have any rights to share your personal information to anyone and will give you credit for the piece unless you prefer to remain anonymous. I Have Vitiligo was created to provide a platform where people with vitiligo (and their loved ones) can connect with one another. It is an online support system to inspire people with vitiligo to live happy lives through stories, guides and personal development tips.